Hi everyone, it’s Cindy from Little Miss Celebration and I’m so excited to share this recipe for your spring celebrations! Pound cake is a big favorite in my family and my grandmother’s cream pound cake is made for every holiday and special celebration. I gave our much loved family recipe a makeover with rose water and pistachios. If you’ve never baked with rose water, you’re in for a great treat! It brings a light sweetness and amazing fragrance to baked goods, and pairs beautifully with pistachios. So bring a touch of rose to the table for Mother’s Day, a bridal shower or a spring brunch! 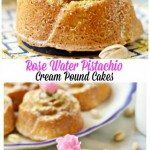 Rose Water Pistachio Cream Pound Cakes, baked in rose shapes, are beautifully textured with a light, sweet flavor. Whether baked as individual cakes or in a tube pan, this luscious pound cake is a wonderful ending to a spring meal! 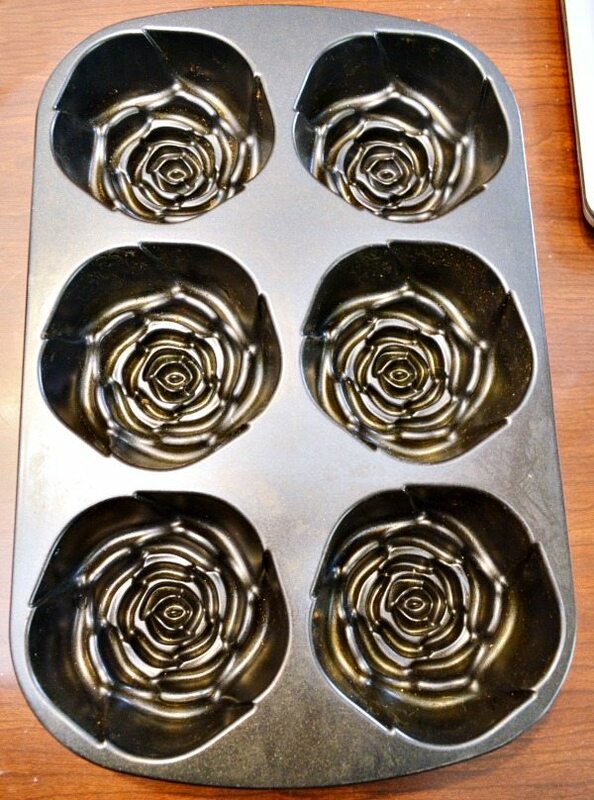 One year, my Mom gave me this Nordic Ware Rose Bud Cake pan for Mother’s Day, because she knows how much I love roses. I thought it was the perfect pan for this recipe and gives me individual desserts to serve. You can absolutely bake this in a single Rose Bud Pan and have one fabulous cake! It bakes so nicely and holds shapes, like these roses, beautifully! When you’re ready to serve the cakes, sift some confectioner’s sugar over the top of each cake and add a generous sprinkle of ground pistachios. It’s a pretty touch, if serving these cakes for a holiday or event, to add a silk rose bud to the center of each cake. When this recipe is baked in a tube pan, it develops a fabulous, crusty top which may crack a bit – that’s perfectly normal! I think you’ll love this cake! Rose water also pairs perfectly with almonds! 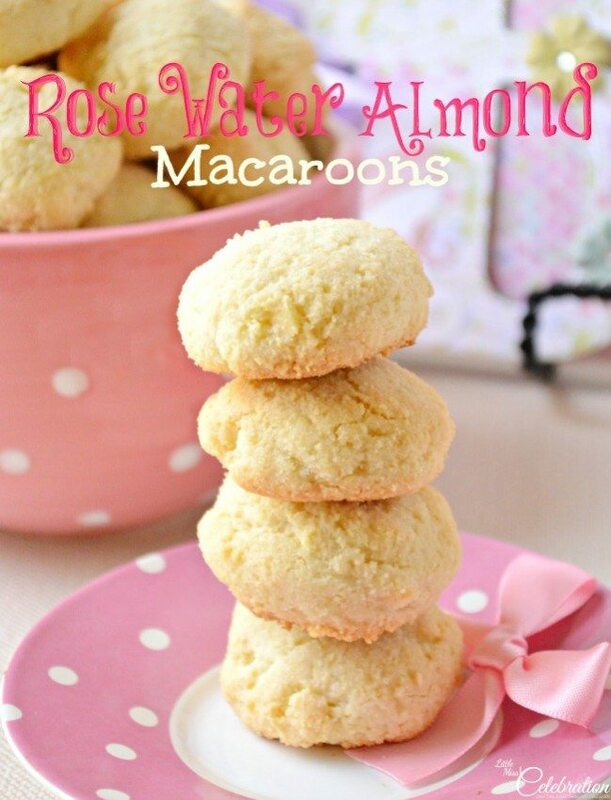 Try these fabulous Rose Water Almond Macaroons, from an 1818 recipe! Need another mini dessert? 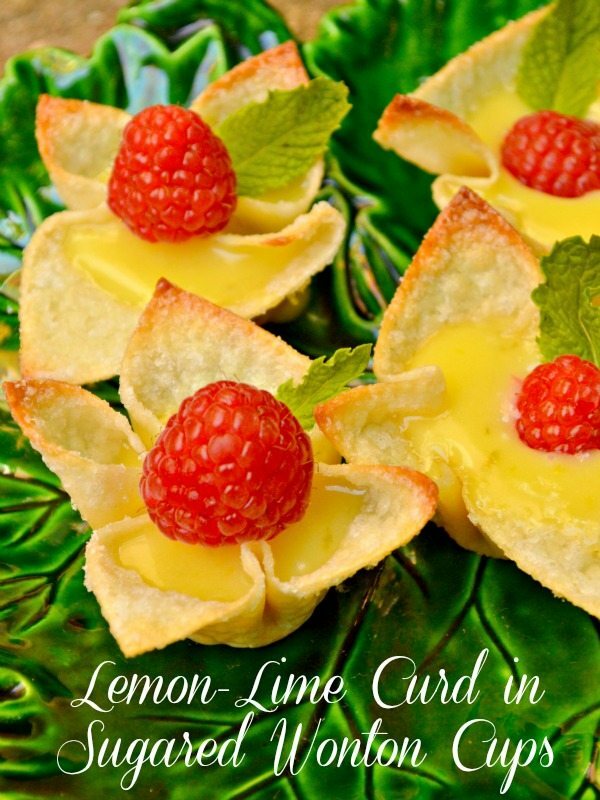 Lemon-Lime Curd in Sugared Wonton Cups is easy, delicious and so pretty on the plate! It’s been wonderful being here today and thanks to Jenny! Enjoy Mother’s Day and spring! 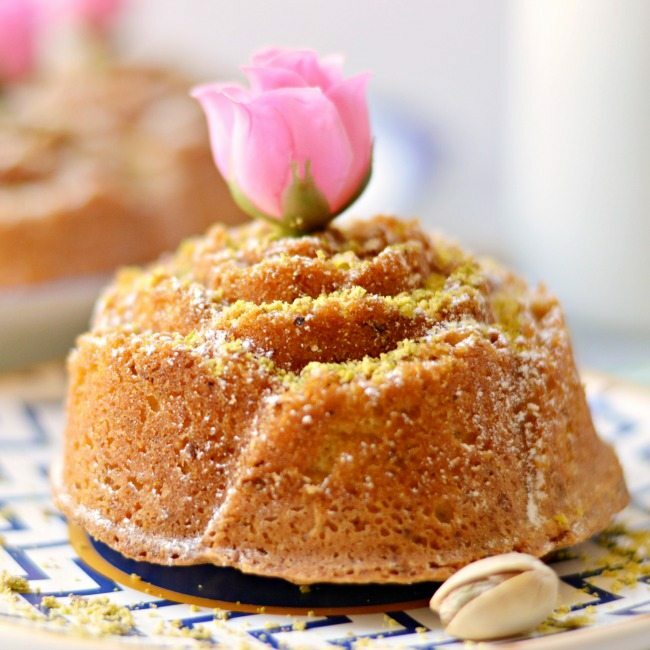 Rose water and finely ground pistachios add a delicate, sweet flavor to this beautifully textured pound cake. Bake in a rose bud cake pan for lovely individual desserts! Grease and flour or spray with baking spray rose bud cake pan. If making in a 10” tube pan, line bottom of pan with parchment and spray entire inside of pan with baking spray. Combine flour, baking powder and salt in a mixing bowl and set aside. Beat eggs at high speed for 5 minutes or until the eggs are pale yellow in color. Gradually beat in sugar, rose water and vanilla; continue beating until sugar is thoroughly dissolved. Add flour and ground to egg mixture, alternating with heavy cream; beat on medium speed until well blended. Add ground pistachios and beat on low speed. The batter should be quite thick but creamy. 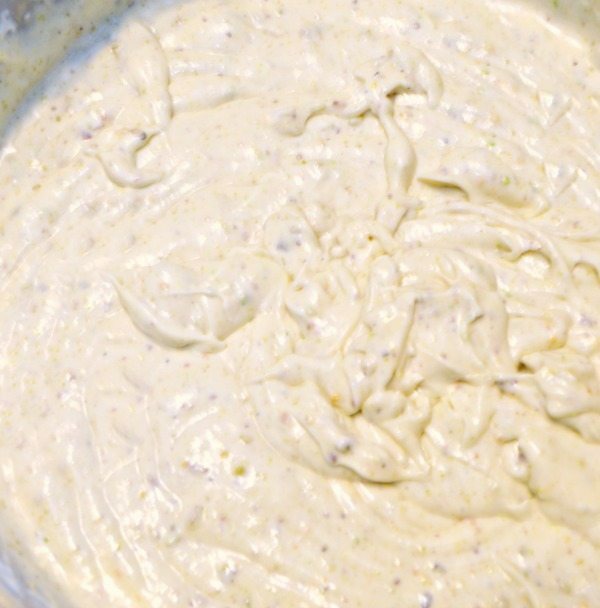 If it seems too dry, additional cream one tablespoon at a time. Spoon batter evenly into individual cavities of prepared rose bud pan, filling about two-thirds full, or pour all batter into tube pan. Bake rose buds for approximately 30-35 minutes or until cake tester inserted in center comes out clean. Bake in tube pan for 60-70 minutes; if the top of the cake appears to be browning too much before the cake is done, cover the top lightly with aluminum foil. Cool rose buds cakes or tube cake for 15 minutes in pan on wire rack before removing and cool completely on wire racks. 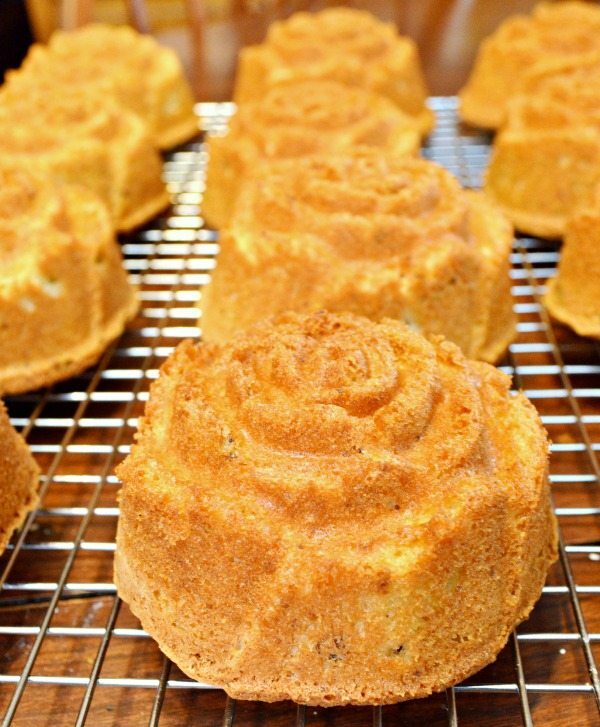 Continue baking rose bud cakes until all batter is used; recipe makes about 14 cakes. 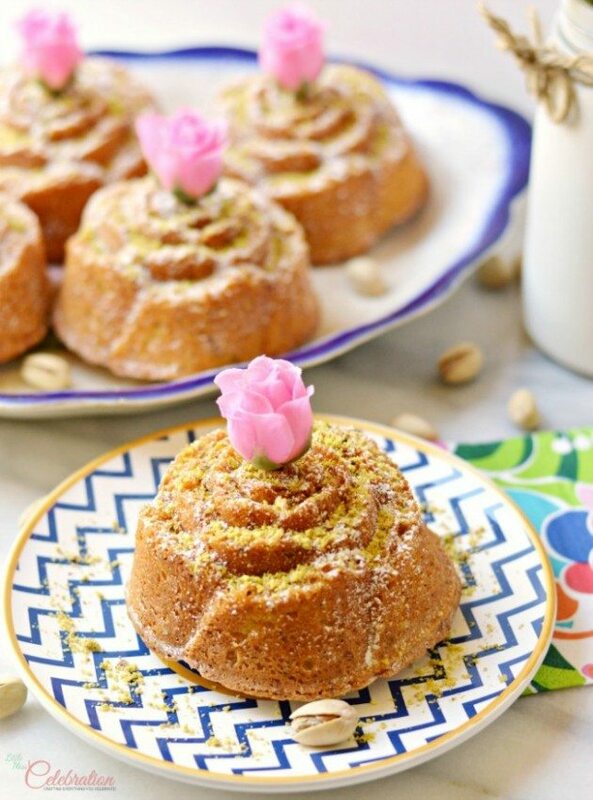 Before serving, sift confectioner’s sugar over tops of cakes and sprinkle generously with reserved ground pistachios. Add a silk rose in center of cake, if desired.